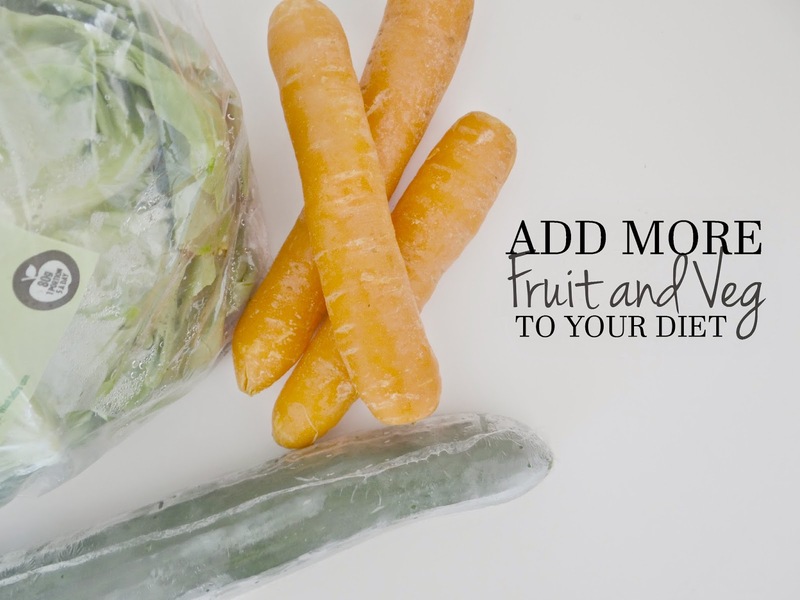 ADD MORE FRUIT AND VEG INTO YOUR DIET! Before I started Slimming World I never bothered with eating veg and fruit. Maybe I would have the occasional Strawberries and cream and the added veg to a sunday dinner, but that is all! I look back now and I do think it was quite shocking that I hardly ever ate any fruit or veg. Being a Slimming World Member I need to eat fruit or veg as part of every meal. It has helped me. It was a struggle at first but I got used to it and now I enjoy eating fruit and veg with most of my meals. Many people aren't keen on eating either fruit or veg but there are ways you can hide it in your food, by mixing it up. Lettuce is one thing I am not keen on. I buy it already cut, but I still cut it smaller! I've never liked the taste of lettuce but I do eat it when it's been cut to smaller chunks. If you have a salad then you can chop everything up, it may be easier for you to eat it and enjoy it too. I am sure a lot of parents do this with their children's meals. For example; Spaghetti Bolognaise, you can chop your onions and mushrooms small and mix it in with the bolognaise. When you have your Sunday dinner you could mix the veg with the gravy and potatoes. It could get rid of the taste a bit. With your salads, if you don't like the taste, add some sauces to make it tastier and eatable. You can also do the same with fruit and veg. Add yoghurt with fruit (perfect dessert) and add some herbs or a sauce with your veg. Fruit and veg don't have to look boring! You can make it look nice by making it look fancy on the plate or maybe even using a spiralizar. If you don't like the taste or the crunch, then you could blend and make a smoothie! I find making a smoothie does give fruit a much nicer taste. I really enjoy Banana and Strawberry smoothie. If you are a lover of fruit and veg then you could double the portions! Eat them as your snacks and add more to your plate. You could also change your chips to roasted carrots, your crisps to an apple, and maybe you could swap one thing on your plate for some extra veg. Legal & Legal encouraged me to share my eating tips. By eating healthily, it gives you a healthy lifestyle too! Many people, such as my Dad, had bad health when he was overweight. He lost more than 6 stone by eating healthily and excersice, his health is much better now. He doesn't suffer with extreme high blood pressues or angina attacks. This is all down to a healthy lifestyle. Take a look at Legal & Legal's Life Insurance calculator here. * I was sent a spiralizar in return of this post.